liest, ist selbst schuld. Der Text gibt lediglich den Grauwert der Schrift an. Ist das wirklich so? Zweck, da sie eine falsche Anmutung vermitteln. As you can see, I manually inserted \para everywhere necessary, and commented the newlines before it (to avoid having the pilcrow at the beginning of a line). Therefore, I also couldn't really use the \blindtext command, but had to manually insert its text. don't mess up everything else, including (most) macros from other packages -- since that happens when I simply redefine \par globally. I know too little about plain TeX to think of a low level solution -- maybe there isn't even one, but if so, I'd probably prefer it. However, as I am required to use XeTeX's font features for this project anyway, maybe there is a programmed LuaTeX solution (since, afaik, changing from XeTeX to LuaTeX isn't that complicated)? gefburn}? Kjift~-- mitnichten! 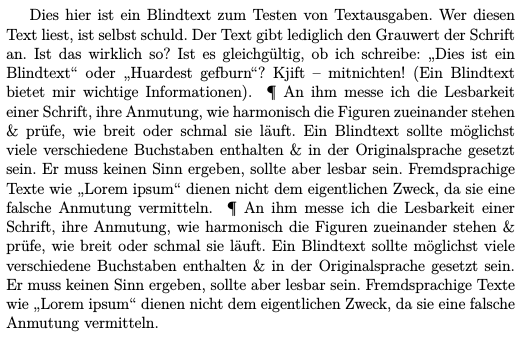 (Ein Blindtext bietet mir wichtige Informationen). möglichst viele verschiedene Buchstaben enthalten \& in der Originalsprache gesetzt sein. 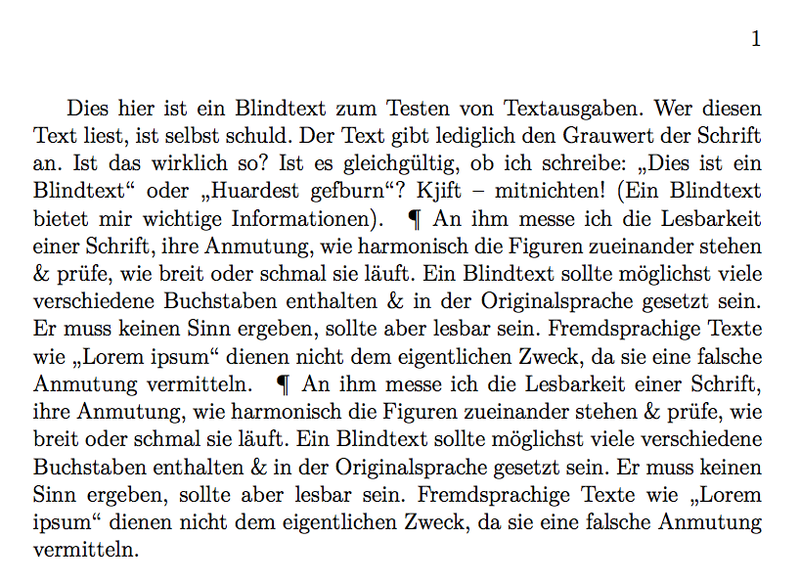 Since \par is redefined, you can use \lipsum or \blindtext. in order to avoid the problem. Having \lettrine inside the environment would lead to strange shifting of the L.
Not the answer you're looking for? Browse other questions tagged xetex luatex paragraphs or ask your own question. How do I redefine the paragraph style midway through the document (and then go back to the default)?